February 11, 2018 1-4:00 pm. The talented Linda Ayre will exhibition her abstract paintings during the month of February at Gallery 1855. The exhibition will run from February 5- February 28th. The artist reception and open house will be held February 11th from 1-4:00pm. Linda has been a Davis, CA resident since 1990. She was Born in Glendive, Montana, raised in Santa Monica, CA and lived extended periods of time in San Francisco, Peru, and Mexico, which gave her many diverse memories and experiences. She first became interested in painting and art in the 70’s while living in Oaxaca, Mexico where vivid colors, animals, plants and uncommon situations were visible on a daily basis in the extraordinary, ever surprising local art. For 14 years the beautiful tapestries and weavings, colorful ceramics, and brightly painted wood carvings as well as the paintings of indigenous artist painter were her portal to art and when she began painting, they permeated every painting she did and still have a dominant influence on her work. Her paintings, now, are a mixture of the subjects that interest her today and those vivid colors, those characters and situations and the memories of experiences (sometimes magical and surreal) that she had. During her life in Oaxaca she was immersed in the unreal real realm of Indigenous art where the normal limitations of human and animal behaviors do not apply. During these years she was influenced by the art of Rufino Tamayo, Francisco Toledo, and Frida Kahlo as well as by the paintings of the indigenous Oaxacan artists who worked in the Taller de Artes Plásticas Rufino Tamayo from 1978-1984: Eddie Martinez, Justina Fuentes, Maximino Javier, Amador Montes, & Guillermo Brena . Twenty years later, in 2007, after retiring from teaching and school administration in Woodland CA., Linda began painting and took her first formal classes. Watercolorists Joyce Laws, Betty Berteaux and Christine Shackel were her first teachers in California. In 2008-09 Linda studied oil painting in Paris at the Academie Port Royal in a studio art course with Jean-Maxime Relange and Dina Pickard. In 2010 she returned to Oaxaca, Mexico and entered an advanced studio art class with Guillermo Brena. After returning to Davis in 2012, Linda worked on her own and took classes with Betty Burteaux at the Davis Art Center. In 2013 she was accepted into the Different Strokes Art Critique Group. 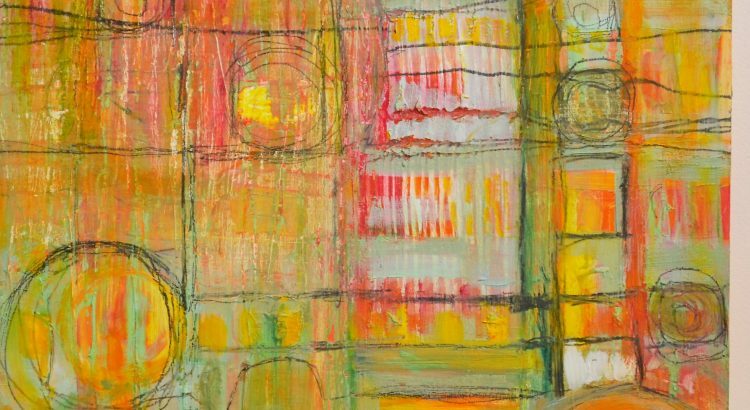 In 2015 she took both an Oil & Cold Wax Mixed Media and an Abstract Painting, Drawing & Collage workshop with Sara Post which moved her toward abstract painting. Linda is interested in painting the out-of-ordinariness of ordinary things and the juxtaposition of perceived important and the non-important. She sometimes takes on the painting of individual plants or animals as an opportunity to explore and understand their uniqueness. Recently Linda has been exploring abstraction and other genres to express her art including cold wax and oil, collage, India ink, & charcoal used in abstractions. Some of her acrylic abstracts are shown in this exhibit. She has exhibited in Davis, CA at: The Chen Building (2009), The Tsao Gallery, a group exhibit (2013), The International House, a group exhibit (2015). She is presently showing her work at the Gallery 625, Woodland, CA. Gallery 1855 is a contemporary, non-profit art gallery that displays local artists at the historic Davis Cemetery District. Visitors can enjoy the gallery Monday-Friday 9-4:00pm and on second Sunday from 1-4:00pm.